This is one of my favourite prawn recipes. My Firecracker Prawn 65 is inspired by the the undisputed big daddy of Indian bar snacks – Chicken 65. This crimson-hued, deep fried, hot and tangy chicken dish even has its own (ever-growing) lore woven around its intriguing name. Why 65 you ask? Well, the straightforward stories speak of 65 chillies in the marinade, other tall tales tell us of a marination period of 65 days and some even more imaginative ones say the age of the chickens has to be 65 days – no more, no less! But the real story is a little more staid – Mr.Buhari, the enterprising owner of Chennai’s iconic Buhari restaurant created this cracker of a dish, which appeared on their menu in 1965. And my prawn 65 recipe is a tribute to his culinary ingenuity. Chicken 65 looks every bit like it belongs to the era of technicolour. Its almost lurid orange-red coating, which is eye-catching, tempting, is actually more of a red herring (pun intended!) that promises atomic levels of heat but doesn’t really burn the house down. In reality, the colour is lent by Kashmiri chillies, that have a rich hue but only medium levels of heat. Mr Buhari would’ve never imagined how popular his brainchild would become. Literally every Indian state has added its own touch to make it their own. Restaurants as well as street food vendors embraced it, and have been cooking it and serving it with unflagging intensity; so much so that today Chicken 65 is considered a classic. 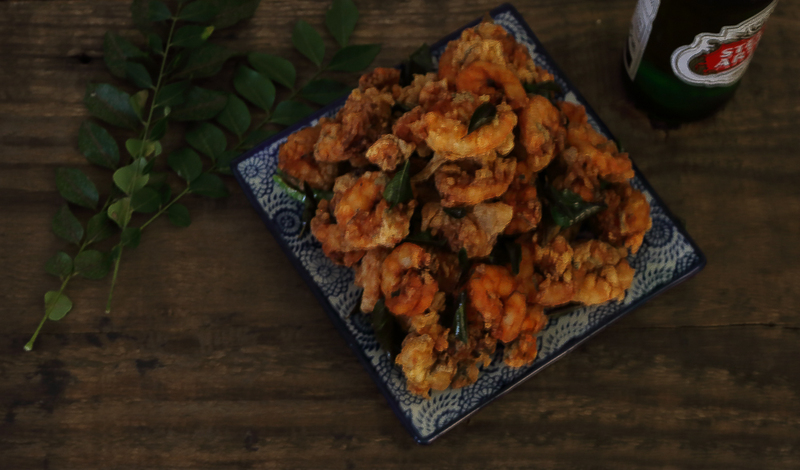 A classic that I thought would be just as smashing with seafood; think prawns or calamari, popular as quickly fried up, crispy appetisers that are perfect companions to alcoholic beverages of all kinds. A tall, blonde beer on a hot summer day or a crisp chardonnay with close friends begs a salty, spicy, crisp but light bite that’s more than a nibble and less than a full meal. Fragrant with the earthy scent of curry leaves, this Prawn 65 recipe promises just that. When I want to drink leisurely with my friends and keep the conversation flowing without breaking the vibe or a sweat, a prawn recipe like this is the ideal snack to keep hunger pangs away without inducing yawns. Once you have your cleaned and deveined the prawns, this is one of those prawn recipes that demand a minimum amount of prep till you fry the prawns. Very few ingredients are needed for this prawn 65 recipe but what you cannot do without is Kashmiri chilli powder or paprika, a must to get that signature siren red. Don’t forget the curry leaves for that typically South Indian touch. I also added regular cayenne or red chilli powder for extra heat but you can completely do without it or crank it up further if you so wish. The original Chicken 65 recipe uses yoghurt seasoned with chilli powder to coat the chicken before serving. I decided to skip this to retain the crispiness of the prawns. Even without the yoghurt, the prawns are little nuggets of delicious dynamite. What I find most delightful is that the tempura-like exterior hides a fat, juicy, succulent shrimp bursting with the flavours of the sea. I even used a few leftover prawns to make sandwiches with a slathering of mayonnaise. Try this slightly kitschy but crackling prawn recipe, you’ll become a fan. Of that, I have no doubt. A crisp, hot, street-food-style prawn snack with the distinct aroma of curry leaves. In a mortar or food processor, make a thick paste (without adding water), using all the ingredients for the marinade. Mix the marinade into the prawns making sure that all the pieces are well coated. Cover and set aside for 20 minutes. Heat enough oil for deep frying in a deep pan or fryer. While the oil is heating, beat 2 eggs in a bowl, and mix all the 3 flours with the seasoning in a separate shallow tray or bowl for coating. Make an assembly line starting with the marinaded prawns followed by the egg wash and finally the dry flour mix. This will allow you to fry quickly in an organised fashion. When the oil is about 175℃, first, very carefully drop in the curry leaves and green chillies for a few seconds and remove. Drain and set aside for garnishing. Then, dip each prawn lightly in the egg, coat on all sides with the flour mix and drop into the oil. Fry only a few at a time taking care not to overcrowd the pan. Fry the prawns for 2-3 minutes till crisp. Arrange the hot prawns on a platter, sprinkle the curry leaves and fried green chillies over and serve. Thank you Tandy! A good way to tame the heat would be to use paprika for colour and only as much cayenne as you can handle. Would still be as delicious. This sounds amazing! I’ve never tried Chicken 65, but I love spicy food so I think it’s right up my alley. I’ll have to try your prawn version!